Are you a clear stamp or wood stamp kinda of stamper? So today Stampin’101 is a big solution for your clear stamp. Many ask me how to keep them on the clear block so they will not fall off well first your block need to be CLEAN, the Perfectly Placed Guide #121785 help lots. Someone once told me to apply a light coat of 2-way glue #100425 and let dry would do the trick and I try it and it is a miracle work. When I was getting ready for the big fundraiser last month I was panicking with the clear stamp falling so I decided to apply the 2-way and man oh man it was perfect NONE of them fell off the clear block. You will see in the video on my blog at www.frenchiestamps.com how quick and easy to apply the 2-way glue. Just apply a light coat and let dry. I bet you are wondering how often you need to do this well the answer is unknown at this time cause it’s still working great. So my guest is it will last a long time. All these lovely cards that I did last week is to welcome my new team member. I stamp with the Stippled Blossoms that I have in clear and they didn’t fell off once so wonderful. Talking about my team …..
Did you ever thought about joining my team/Stampin’Up! ? If so what stop you? 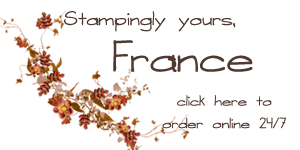 YOU don’t need NO experiance to get more for your money and to get a discount on your Stampin’Up! product. Right now during sale a bration you get YOUR choice of product up up $150.00 only pay the $99.00 and it’s FREE shipping. It’s so much for your money and so much discount after you join and if after you join you feel it is NOT for you no problem you keep everything and you be my customer again I would love for YOU to try it out and see all the benefit plus the new catalog will be available to demonstrator sometime next month..
Let me know if I can answer any question. I have the most Q&A CLICK HERE and if you have any other question or concern please e-mail me or call me I would love to answer all your question then would love to Welcome you on the team and Stampin’Up! family. Nothing to loose but lots to gain! If you are ready to join just CLICK HERE then on the left side click on the Join NOW. I would love you have many many more on my team. Thank YOU and Welcome to Stephanie B and Vanessa F who join this week. Great deal this week again CLICK HERE to place order or closeup look. Thank You soooo much for this very informative video. Oh and I was a SU demo for 4 years and I never knew that about the Stampin' Scrub!!! Thanks for the info!!! Great tip!!! I absolutely LOVE, LOVE, LOVE your almost daily videos! They are so informative and you also give tips on using products, which I appreciate. Here's a tip: Your blocks will go in the dishwasher. I wonder if the Stampin' Scrub mats would too??? Love this idea. I have been using this tip for years and they last for a long time. Another tip that I use when I do classes, is put two way glue on a clear block, let dry and then attach the stamps. Everyone uses this and they love it because it is so convenient. Also I cut a piece of acetate the size of the block and I put a little star sticker on the acetate with the 2 way glue and i keep them in a box. This keeps the block separate and ready to go. Just remove the acetate, stamp and then put it back. Have fun.